He wasn't down then, but how will the No-Whistle Missile go down in Auburn memory? Auburn lost its best football player Thursday night. In trying to process what exactly the loss of Michael Dyer means to Auburn’s football team, that fact can’t be sugar coated. Can Dyer be replaced by one of the gaggle of running backs coming back in 2012? Probably, but his dependable production on the field will be missed. Will his presence in the locker room? Not so sure. Something has apparently—and obviously, in hindsight—been going on with Dyer since before the 2011 season began. Auburn beat writers, particularly Jay G. Tate, hinted at issues early in fall camp. Chizik listed Onterio McCalebb ahead of him on the initial depth chart, an odd move at the time despite the coach’s insistence that people not read anything into it. Carries were limited in several key games throughout the season, with the occasional heavy load (41 carries against South Carolina) sprinkled in to keep fans confused. Message boards were abuzz with rumors of unsavory behavior and serious attitude problems. When the talented tailback was initially suspended indefinitely prior to the Chick-Fil-A Bowl, chatter began that he would never again see the field at Jordan-Hare. Chizik insisted at the time that if Dyer ever put on an Auburn uniform again then he would have done everything asked of him to earn that chance. Apparently Dyer wasn’t interested in taking his coach up on that opportunity. Phillip Marshall of Auburn Undercover confirmed last night that a conditional release has been granted by Chizik for Dyer to leave for another school, presumably Arkansas State. Reuniting with his former offensive coordinator and new Red Wolves head man Gus Malzahn might be the best thing for the diminutive speedster, but it is also the most puzzling aspect of this story if it does indeed happen. Why leave an SEC program known for producing NFL running backs for a Sun Belt school where he’ll have to sit out a year unless granted a rare waiver from the NCAA? Maybe it’s his best option. Maybe it’s his only option. If even some of the tales are to be believed, and at the very least there is no denying he did something serious enough to get suspended for the bowl game and potentially beyond, then it is also somewhat surprising that Malzahn would be willing to take Dyer with him (one can only wonder what Kristi Malzahn thinks of the idea). Still, he is a phenomenal talent and can help his old coach win games. Maybe that’s reason enough. Whatever the reason for Dyer’s departure, there is no question that the former five star recruit—the Auburn five star curse continues—did more in his first two seasons on The Plains than any to carry the ball before him. He chalked up two 1,000 yard seasons and leaves with a ring and a BCS National Championship Game Offensive MVP trophy that can never be taken away from him. 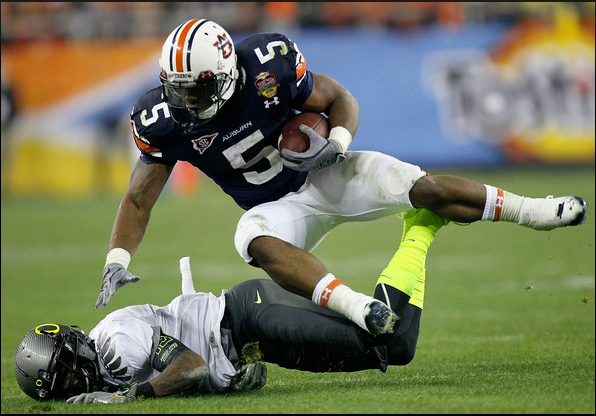 His game changing run against Oregon will live on the memories of Auburn fans forever. Is that memory somehow cheapened now that he will not finish his career as a Tiger? It shouldn’t be, but it’s hard to tell the long term effect while the news is still so fresh. Auburn fans should be fairly disappointed in how things turned out and can fairly shake their heads at the wasted opportunity to be an legend among legends at Running Back U. But the finger wagging and character assassinations should be left to other fanbases. Dyer is gone now and he is not coming back. Best to remember the good times and the success he helped this team achieve, and hope that he finds whatever it is he’s looking for. Best of luck to Michael. I can’t help but to think about Brandon Jacobs blasting Tiger Walk in his teched out car. When he left, I was bummed but we still like to claim him as one of our own — maybe because it took forever for him to get there — and hopefully things mend with Dyer so we can do the same. I wonder if T.J. Yeldon is reconsidering his switch from Auburn. Excellent article as always. I wish the best for Mike Dyer in the future, where ever he lands. He’s a wonderful talent on the field. I pray his off the field issues get resolved in a positive way and he uses this experience as an opportunity for growth and maturity. War Eagle Michael Dyer and thanks for the wonderful memories!! He has proved he can cut it in the SEC. At least on the field. So why not go to the Sun Belt and a chance to put up ridiculous numbers if he is not happy at Auburn? Wonder if he will be sporting an Auburn license plate on his ride when he is in the NFL like Brandon Jacobs does? I would say as far as Gus Malzahn is concerned he is probably calculating risk vs. reward. If Dyer was in trouble, and I have really no idea if he was, a change of scenery is one of the best ways to start fresh. And as much of an asset as he was to Auburn in the SEC, he will be tenfold to ARK St. in the Sunbelt. I don’t know if for Dyer it is really worth sitting out a year and being one year further from the NFL, but for Malzahn and Chizik it seems that one decided it wasn’t worth the risk and the other decided it was well worth the possible reward. Good luck to all. War Eagle. Things like this make me really miss guys like Kodi. I would say that overall, Philip Lutzenkirchen is Auburn’s best FOOTBALL PLAYER, not Michael Dyer. Lutz can and DID catch, run, block, strip balls, recover funbles, and make tackles. Michael Dyer could run the ball. Yeldon already has a job with a car dealership owned by an updyke. That ship has sailed. Hate to see Dyer leave. Lutz is a great football player and there is definitely an argument to be made that he is our best. When I said Dyer was our best player I was primarily referring to the fact that he accounted for about half our offense this year despite inconsistent QB play, a less than dominant line and limited use in several games. When are you going to move on and take down that article about Dyer?